I found this El Rey smoked paprika in my local East Warren store so assume it must be lots of places; It makes for a fast, easy, and delicious roast chicken....very Spanish. 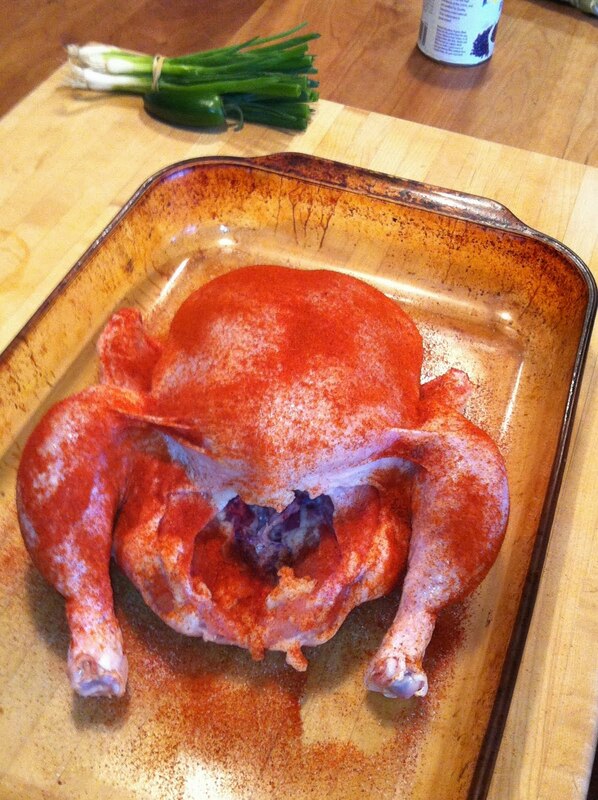 After washing, drying, and making a few small slits in the skin for crisping I lightly sprinkled the bird with salt then a one third to two thirds mix of the picante and dulce smoked paprika straight from the can. You want to make sure you cover the chicken top and bottom but it doesn't need to be a super heavy dusting. I roasted my chicken on a gas barbeque by only running the front burner on medium and placing the chicken sideways on the back of the grill with the cover closed. It took about an hour and twenty minutes and I turned it every twenty minutes. You could easily substitute chicken pieces and roast either of them on a charcoal grill or on a rack in the oven. The paprika is equally fantastic on barbequed flank steak, roast potatoes, and grilled corn.